The château of Blérancourt was built from 1612 to 1619 by Salomon de Brosse, one of the most important architects in France at the beginning of the XVIIth C. who had designed notably the Luxembourg Palace (today it houses the Senate). 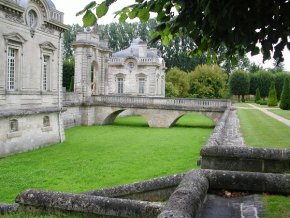 It is the first example of a ‘château massé’ (i.e. without wings on each side turning in on the courtyard), a model which was to be used more often later on and which can be found, for example, at Vaux-le-Vicomte. As one can see in the engraving by Israel Silvestre (ill. 1), the château was located on a large rectangular terrace, still standing, surrounded by a dry moat. This terrace, necessary due to the swampy terrain, was divided in two by the building which consisted of a central structure and four pavilions in each of the corners giving it the form of a capital I. On one of the small sides of the rectangle, near the entrance (it cannot be seen in the engraving) a huge door flanked by two pavilions jutted out over the moat. The château was destroyed during the French Revolution with only the door and the pavilions at the entrance of the terrace (ill. 2) surviving the pickaxe, as well as a part of one of the corner pavilions. In 1931, a section of the castle on the south side was reconstructed to house the Musée national de la coopération franco-américaine. Since the collections of the museum have grown considerably in the last few years, it had been decided to extend the present structure. The project was to be financed in part by The American Friends of Blérancourt. But construction had been stopped for the last two years. 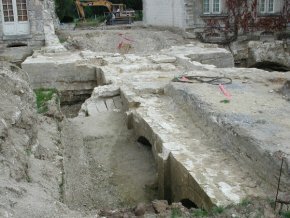 When work resumed last June, important architectural remains of the château as it appeared at the beginning of the XVIIth C. were brought to light. It is hard to know exactly the nature of the discovery as the site is not open to the public and we were not able to obtain a visitor’s permit. According to our sources, it seems that the entire underground system for the terrace, which was an integral part of the architectural plans designed by Salomon de Brosse is intact. Under the back part of the castle (the one best seen in the engraving), all of the cellars are standing, but without the vaulting (ill. 3). The basement of the main structure, razed during the Revolution, also remains and contains the two flights of the château’s main staircase. However, the most exceptional find is located under the front part of the terrace where the archeologists discovered a totally unique system, with no known examples before or after : between the existing door and the façade of the castle there was a viaduct (ill. 4), of which four arches have already been unearthed in perfect condition. Visitors were supposed to walk on this viaduct in order to cross over a large empty space, as deep as the exterior moat before arriving at the façade, where the lower parts have also been dug up. This is thus an integral part of the château’s structure, and totally unknown before now. As one may notice, the engraving by Silvestre reproduced above seems to indicate that the courtyard in front appears to be at the same level as the rest. Jean-Marie Pérouse de Montclos confirmed to us that this new information, which he has not yet studied, proves that this engraving is false and that it led him to mistaken conclusions in his work Histoire de l’architecture française . If one is to believe the contractors, normal procedures were observed but it was not possible to know that there were significant archeological remains on the site where new construction was to take place. And yet, it is important to note that any building activity that takes place in a special zone, be it by an individual, a company or a municipality should undergo an archeological survey, beforehand. This requires systematic probes of the ground according to a grid layout. Either this thorough study was not carried out, which would mean that the Ministry of Culture did not apply its own rules to itself in this case as it does elsewhere, or else it was completed but the INRAP, Institut d’Archéologie Préventive, did not do its work correctly. According to Richard Rougier, associate scientific and technical director at INRAP Picardie : “A diagnosis was made in the fall of 2003, but we were only entrusted with a very small section located at the back of the castle where we knew there was a destroyed wing. We found a cellar which used to be under this wing. At the time, the architectural plans were in the early stages. In 2004 and 2005 we received a request for measurements of existing structures. We were never given the mission of carrying out a complete survey of the ground involved in the project.” It would thus seem that the first case applies : the mandatory architectural survey was never carried out. The situation today is extremely complicated. It is of course necessary for the archeologists to have enough time to study the site thoroughly, but also that careful thought be given to what should be done with the remains of the original castle in light of their obvious architectural and aesthetic importance. It is hard to imagine that architectural elements of this quality could be allowed to disappear. Hence, it is hard to understand that barely a month and a half after this unexpected discovery (what’s more during a vacation period), the Ministry of Culture released a press statement which already spells out the plans for a part of these ruins, omitting on the other hand any mention of those at the back of the castle and neglecting to say that they are to be destroyed. The viaduct will be partly taken down to be rebuilt. It is well known what happens generally to architectural elements which are dismantled for later use, when no location, no funding and no deadline are given. There are drawers full of these projects. There is a general impression of ‘déjà vu’ in this affair. The case is in fact comparable to what happened at the Orangerie Museum in the Tuileries gardens. By claiming to create a new cultural establishment and fascinated by the “geste architectural”, the site was overlooked for its archeological interest. And when vestiges were found, it was already too late  It is therefore essential, in this particular case, that the officials concerned take their time and not act hastily under pressure. Certainly, the American Friends of Blérancourt must understand the importance of this discovery and the need to protect a threatened heritage. They are the heirs of Ann Morgan, daughter of John Pierpoint Morgan, who founded the Musée de la coopération franco-américaine and who acted before to protect French monuments. Defenders of the site have already started to mobilize support and seem to be making progress. Just today a visit to the site was organized for local elected officials. 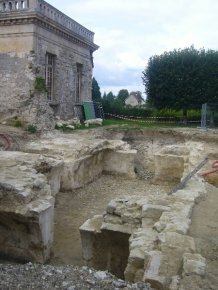 The mayor of Blérancourt, Monsieur Patrick Laplace, whom we contacted, said that they had been told that, for the moment, it was out of the question that anything be dismantled before knowing the results of the excavations. This information contradicts the press statement issued by the Ministry. Will it change its mind ? A decision should not be made for the wrong reasons, especially given the stakes for French national heritage even if this implies a delay in the extension project for the museum or even its cancellation. Jean-Marie Pérouse de Monclos, Histoire de l’architecture française. De la Renaissance à la Révolution, Paris, 1989, p .239. Op. cit. note 1. The reasons for which this engraving is false require further study. The condition of the castle as it is represented might be an interpretation of the engraver, or an idea of the architect which was not carried out ;the courtyard might also have been filled in already at this time. Once again, this affair proves the absurdity of reconstituting models from old documents whose trustworthiness should always be considered carefully. He explained to us that the decisions are taken by the Direction des Musées de France (Direction of French Museums) who is the prime contractor, DRAC being only managing contractor for this site. It is striking to realize how poorly, in France, the world of museums and that of historical monuments communicate and understand each other.